911 Emergency Autonomous Call Center Server: Main Menu Technical Documentation - Emergency Phone Service for community alerts and warnings. This section of our technical library presents information and documentation relating to Emergency Notification Systems and Disaster Recovery Applications. In the event of a blizzard, wild fire or devastating flood, your community can be notified quickly given specific instructions if an evacuation is required using our emergency broadcasting service. Should an emergency arise in your community, our emergency broadcast phone service can deliver large volumes of phone messages quickly using thousands of digital and analog phone lines simultaneously. If a dangerous chemical spill occurs in your community, you can target specific areas to call. If a severe snow storm hits your area, your community can be notified of school closings or event cancellations. DscACS can be used to fully automate a Voice Blast server. See the AcsApi32 routines for exposed functionality. It is a service, and must have an entry in the “services” file. DscACS is in communication with the DialerInterface & PDialerPlus (via internal RspApi32 routines) and a daemon (cmpapid – via internal CmpApi32 routines) on the linux (or cmpapidsvc on Windows), which handles DBASE Campaign & List Manager Issues. Fig. 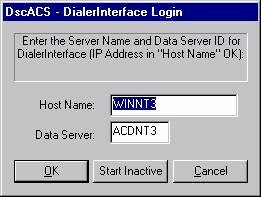 1 indicates the location and name of the DialerInterface, and Fig. 2 is for the location of the cmpapid service (always called “cmpapid”). An entry in the “services” file is required for cmpapid. 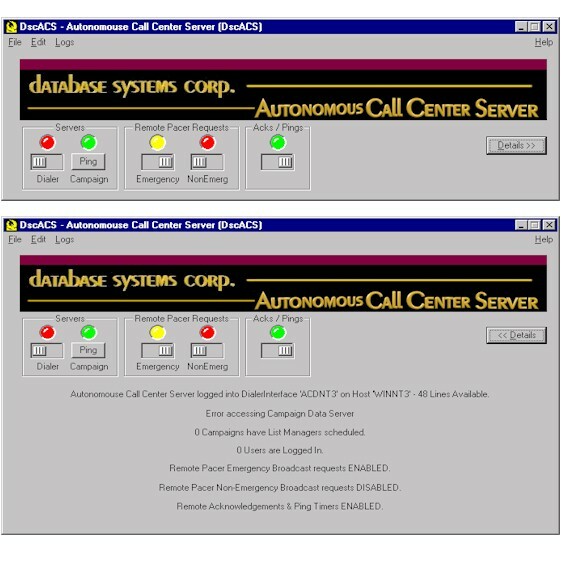 The main screen for DscACS indicates the status of its connections, and provides a controls to enable/disable remote emergency and non-emergency blast requests, and remote Associate alert and user ping timers. There is a “Details” view available which provides more information. If a Pacer (DscACS) installation is to be used for fulfilling remote blast requests (from other Pacers), then the site can indicate whether it is positioned to handle emergency requests, non-emergency requests, both, or neither. Disabling the timers is useful during testing. 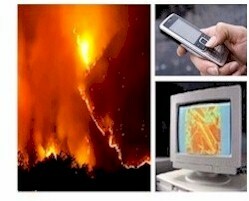 Alert timers are used during emergency broadcast distributions, in order to ensure timely responses from Associates. Timeouts here will trigger a variety of behaviors, including searches for other Associates, or local dialing. DscACS “pings” clients logged into it on a regular basis, and they must “pong” back or risk being dropped from the server. The LEDs indicate the status of the connections and options – green for active/logged on/on, red for inactive/not-logged on/off. One condition – yellow – may be shown for the status of remote Pacer blast requests – if it is enabled, but DscACS is not logged into DialerInterface or getting successful ping responses from cmpapid, then these LEDs will indicate a “yellow” condition. Under the Edit menu, administrators may maintain Password & Associate records, as well as configure the Email trace notifications and other general preferences. If a blizzard or severe snow storm is threatening your community, our emergency phone service can help you notify your emergency response staff and neighbors. With our emergency phone service, you can broadcast warning messages to thousands of households in your community warning of catastrophic disasters including blizzards and severe winter storms. Messages can be simultaneously delivered in just minutes using our network of phone systems and services. 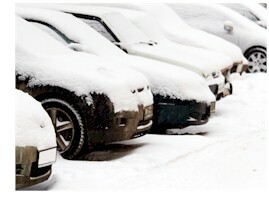 Pre-recorded warning messages can be played giving households information regarding the blizzard location and whether a community should take special actions. You can send a broadcast warning to specific neighborhoods or communities in the event of a blizzard and provide priority delivery of these messages to those in remote areas where utility or public services may be suspended. Multiple messages can be delivered to different members of the community based upon proximity to the storm and areas most effected by the blizzard. Calls can be directed to operators that are standing by to handle special individual emergencies. Messages can also be broadcast to emergency responders such as EMS crews or other volunteers or special assistance from emergency personnel.